Annie was born at the age of 7. 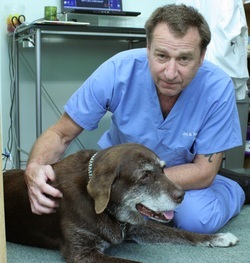 That’s when veterinary surgeon Dr. Joel Woolfson rescued this sweet, gentle dog from a life of abuse and neglect. For the next ten years, wherever Joel could be found, there was Annie, adoring the man who dedicated his life to her. With Joel, she knew what too few animals ever do—the joy of being safe and loved. And she returned the devotion. Sadly, Annie’s journey ended on February 12, 2013. The animal rescue and advocacy community mourns with Joel. His special relationship with Annie made us smile and gave us hope. It was an oasis from the cruelty and pain we confront daily. Annie couldn’t have chosen a more compassionate human to call her own. And we know Joel’s life is forever enriched because she shared it. Rest in peace, dear Annie. May your memory be a blessing. Read about Annie's life here and meet her in this video.